With tendinopathy, you may need to cut back on sports and exercise (running, basketball, skiing, rowing, etc..) because such activities may lead to flare-ups in symptoms and pain. Certainly in early stages -- when you have inflammatory tendinitis -- exercise involving the bad knee may be harmful. Later, if the tendinitis becomes tendinosis, exercise may be restricted due to ongoing pain. 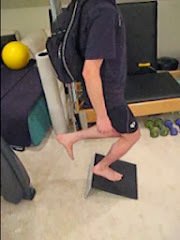 Further, exercising the bad knee is usually not recommended during the first two or three months of an eccentric protocol. The bottom line is you will likely be doing less aerobic exercise if you have tendinitis or tendinosis. Therefore, diet becomes particularly important. Lighter weight means putting less force on the patellar tendon. Ideally, you should weigh yourself on a regular basis and take corrective action if you find your weight increasing from a lack of exercise.